The history of Traditional Chinese Medicine research on sexology can be traced back to more than two thousand years ago, and Chinese herbs have long been used for sexual problems. TCM theory believes that the harmony of Ying and Yang energy is the foundation of a person's overall health. 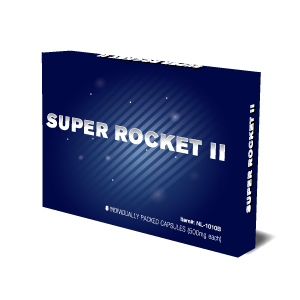 Super Rocket II is an all natural herb formula to improve sexual well being. Made from top quality ingredients, Super Rocket II focuses on nourishing the spleen and the kidneys, adjusting endocrine, soothing the nerves, and promoting blood circulation. Taken two hours before activity, Super Rocket II can boost sexual performance, extend stamina and increase satisfaction; taken regularly, Super Rocket II can increase desire, lower anxiety, and improve overall sexual energy. Super Rocket II is suitable and effective for both men and women. For immediate performance boost, take 1 capsule 2 hours before activity with a glass of warm water. For long term benefit, take 1 capsule every day at night with a glass of warm water. For adults over 21 years of age only.